For once, it's the leaves that take top marks and the flowers that are afterthoughts. Hostas (Hosta spp.) win first prize as most popular perennial plant, thanks to their lush greenery and shade-friendly ways. Some people even snip off the delicate summer blossoms to keep the focus on the foliage. But any major trimming happens in early winter. Hosta flowers can be showy and fragrant. Smooth leaves, puckered leaves, heart-shaped or oval, the size of a thumbprint or big as a saucer, in shades of green, yellow, blue or cream: Hosta foliage is never boring. And when you see the heaping mound of overlapping leaves, each on its own stem, it's hard to believe that they all arise from a single basal tuft. These herbaceous perennials push up their shoots in spring and produce leaves and flowers over summer in U.S. Department of Agriculture plant hardiness zones 3 through 9. If you don't want flowers, clip off the flower stems as they appear. If you like the flowers -- some have a wonderful fragrance -- wait until they fade then clip off the stems with a sterilized garden scissors or pruners. 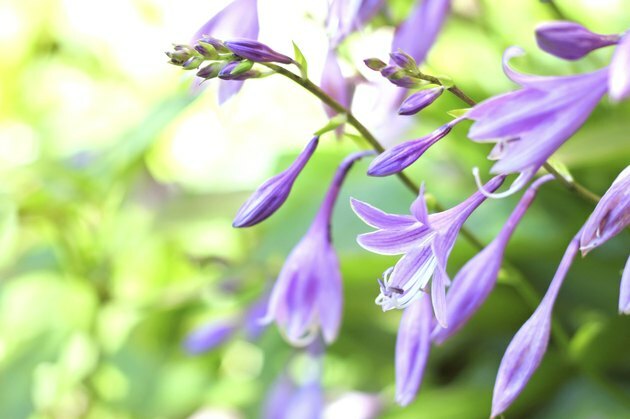 You aren't the only one to love hostas -- many pests do, too. It is high on the preferred list for snails and slugs to dine on. Look for irregular holes along the leaf edges. Rabbits also chow down on hosta leaves -- look for droppings -- as well as deer, which leave larger droppings and less hosta. When pests attack, you'll have to decide whether to go on the defensive or offensive. Cleaning up dead leaves helps keep away the slugs and snails, but only appropriate fencing has any hope of distancing deer and rabbits. In any case, prune out any badly damaged or ragged hosta leaves as soon as you discover them. Hosta leaves graces your shady garden corners in spring and summer, but as fall approaches, the leaves turn yellow and gold. And that's all, folks -- the plant is gone for the winter. The plants require several months of low temperatures to thrive, at least eight weeks below 40 degrees Fahrenheit. So once the leaves die or look unattractive in the fall -- the exact dates depend on your climate -- disinfect your pruners. Cut back all foliage at ground level and dispose of it. That will keep your garden neat and prevent slugs and bugs from moving in for the winter. Some gardeners cut off the flower stems 4 to 6 inches above the ground to mark the plant's location. But don't be too sad, because with good care, the odds are that your plant will live as long as you do, and maybe longer. It's important to sanitize cutting tools before pruning plants, but with the hosta, it is essential. Tiny foliar nematodes, a type of worm, can live inside hosta leaves, wreaking havoc on the plant as they munch away. Look for premature leaf yellowing or dying in midsummer. Because no chemical treatments are practical, it's best to focus on prevention and management. These nematodes spread from plant to plant on water droplets, so avoid overhead watering and watering in the evening. Sanitize the cutting blades of garden tools before each use by wiping with a clean rag soaked in isopropyl alcohol.